I love Grant and Ari's story. A journey of accepting that what you need and want may be different than what you originally thought. More importantly, what others may want for you. Seeing the good in every person, despite your differences. I wish the real world could be more like that. I love the connection that Ari and Grant share. They're both living their dreams. They didn't have to give everything up to be together. That being said, and this is a K.A. Linde book after all, lots of feels are included in this read. I laughed, had tears and I was nervous all at the same time. I had to walk away from my kindle a time or two. Both Ari and Grant worked on facing fears and insecurities in this book. For Grant, that was his past and proving that he wasn't like his father; making peace and moving forward. As for Ari, she realizes that she doesn't need her parents approval. They raised her to be a strong, independent and caring woman. They should trust her and her ability to know what she needs. They realized that it doesn’t matter where you come from, what career you choose, love will find you. It may look messed up to the outside world, but trust and respect will make everything work in the end. Grant and Ari realize that life's problems can be easier dealt with if you let people in, be honest and accept the help they are offering. Most importantly, trusting each other. I would have loved a look into the future with these two. Really who wouldn't want to know how it all ends? I'm sad that this is the end of our journey with Ari and Grant. I have to admit that the book ended in a good place, allowing the readers to imagine the lifestyle that these two will live. This is a SOLID 4.5 star book. I would have liked to see a little bit more interaction with Grant’s father. I understand that where it ended is a good stopping point for their journey. At the same time, I think it needed something, I just don't know what. It could very well be that I'm just greedy when it comes to K.A. Linda's writing, I always want more. I really hope we get to see more of these characters in print someday. Seriously, you must read this! 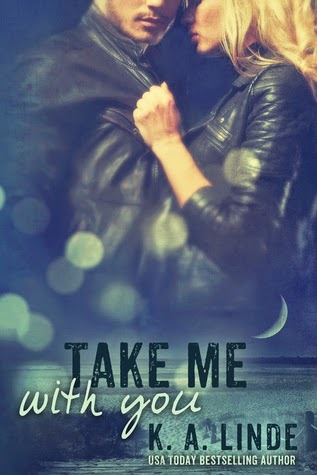 I haven't read Take Me For Granted yet but this series sounds good. You're right! K.A. Linde always makes me feel something when I read her books!